It’s Teacher Appreciation Week and at my son’s elementary school we have been thanking the amazing teachers as best we can. These gestures seem small when we think of all they do with and for our kids, but we try to show our genuine love and respect through baked goods and thank you notes and other acts of recognition. It’s not enough but our sentiment is sincere. 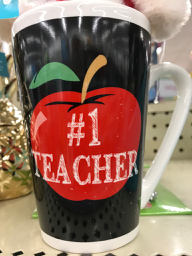 Your teacher does not want this mug. She was also the first teacher who called my love of writing ‘a gift.’ Until then, I just thought writing was one of those things that everybody did. At a time when I was The New Kid, feeling invisible, she gave me an identity and not only nurtured a budding love for writing, but also deepened my love for books. She was gentle and kind, and we knew her classroom was a safe place to explore and reach for the stars. She passed away when I was in college, but she knew I was studying journalism and I hope she also knew that she planted that seed. In high school, another Patricia influenced me. My English teacher Patricia Linzie had a reputation for being tough and suffering no fools. Kids were terrified of her grueling vocabulary tests, but she was unwavering. We read To Kill a Mockingbird, and I still have my dog eared copy, full of highlights and notes on foreshadowing. She taught us intricate rules of sentence structure – but when we finished that unit she did something I found extraordinary: She announced that now that we knew the rules, we were allowed to break them. It was exhilarating. Despite being known as very serious, Ms. Linzie had a great sense of humor and a warm smile, and once she shocked us all by wearing a leather skirt to school. Breaking the rules indeed. She was my first brutally honest editor. I’d gone through school believing that I was a good writer, but I didn’t know how to keep improving. Her advice to “Be honest” has guided everything I’ve ever written since then. She’d write “True?” circled in red pen by a word or phrase that was over the top and darn it if she wasn’t almost always right. She taught me the power of conscientious rule breaking and how a tough, fair editor can turn a good writer into a great one. Another significant high school influence was Ken Henderson, my journalism advisor and English teacher. We read Lord of the Flies and Mr. Henderson taught me the power of silence, how to communicate with just a look. He was brutally honest, laughed loudly and often, and genuinely loved being around his students. But if you saw the vein on his head throbbing, stay out of the way. I was fortunate to observe his firm but gentle leadership style at close range. My junior year he asked me to be yearbook editor – a position rare for a junior to hold - but I was also the first woman editor at my high school. I was terrified and tried to decline but he’d have none of that. His confidence in me gave me strength. I made mistakes – sometimes big ones – and he never let me off without reassuring me that I knew how to do better. But he was also forgiving, so I learned to get back up again after a fall. As someone who is terrified of failure, this was huge. It never got easier, but I learned that life goes on. Through the years I’ve been led and been in leadership roles myself, but whenever I’ve been at my best, I feel I’m somehow channeling Mr. Henderson. These days I’ve even mastered The Look that stops my kids, if only momentarily. But I’ve saved the best for last: Ironically she was first. My mother was my very first teacher. She was an actual teacher before and after she became a mom, and it’s not too cliché to say she taught me most of what I needed to know to be a good person, and a good mother. The older I become, the deeper into parenting that I dive, the more I respect and admire her. She is the center of our family, humorous and thoughtful. I remember my sides splitting with laughter as she did the ‘Special K dance,’ to the amusement of my brother and me over breakfast. She delighted us with signs made for each of us for our birthdays covered with accidentally hilarious drawings of our favorite things. She comforted us through heartbreaks and earaches while working through more than a few of these of her own. She is a constant force for good in the world. When the parenting experience is often more Groundhog’s Day than Mother’s Day, she must have been exhausted for many years but she rarely let it show. The saying goes that ‘You aren’t their friend, you’re their parent,’ and that’s true when your children are young. But now when I return to my childhood home, I see her in the company of her closest friends, many of whom she’s known for more than 30 years. Several have told me they joined their sorority group in great part because my mother was so kind, and they treasure their friendship with her. It’s an incredible gift to know my mother as the full person she is – she always was – even when she was ‘just my mom.’ To be her friend, and her daughter. To know her as a 360 degree human being, not perfect but wonderful in her own generous and thoughtful way, gives me hope that my imperfections will be smoothed out for my kids in hindsight as I’m sure mine has been. Many greeting card sentiments are hyperbolic (thanks Ms. Linzie! ), particularly in the days before Mother’s Day – but I found one card this year that sums it up our current mother/daughter relationship perfectly. Moms and teachers have so much in common: How do we adequately thank them? There's no way to do their contributions justice, but I hope that in my life I've used the lessons they've provided for the power of good. I thank them in all all that I write, all that I am, every day. One week a year isn't enough appreciation to be sure, but then again, moms are allotted just one day. Thank you, to all my teachers, for being right about everything, especially my mom. For loving us, for loving our children, and for reminding us all that we are special and important. I hope we make you proud. We love you and we're grateful.